How did genetic parasites overcome natural selection for billions of years? Nearly half of the human genome is composed of genetic parasites—transposons, plasmids, viruses, and other genetic elements that have one thing in common: they don't make any beneficial contributions to their hosts, and can sometimes have harmful effects. Genetic parasites—sometimes called "selfish genes"—originated early in the history of life and today are present in nearly all living organisms. The discovery that genetic parasites are so ubiquitous and abundant is one of the many surprising findings in the field of genomics, but many questions remain unanswered. One of the most basic questions is simply how genetic parasites have managed to persist for so long, despite the evidence that they are harmful at evolutionary timescales. Typically, natural selection results in deletions of harmful genes, so the main question is, why hasn't natural selection wiped out genetic parasites? In a new study published in EPL, researchers Jaime Iranzo and Eugene V. Koonin at the National Institutes of Health in Bethesda, Maryland, have found that horizontal gene transfer may be one of the keys to understanding the persistence and spread of genetic parasites over evolutionary timescales. In horizontal gene transfer (HGT), genetic information is transferred to an organism by a variety of mechanisms other than the traditional parent-to-offspring process of transferring DNA. For example, an organism may receive genetic material directly from another organism—even one of a different species—or pick up genetic material from the surrounding environment. For genetic parasites, HGT offers a way to infect new hosts, providing a potential mechanism to compensate for the losses due to natural selection. Early studies have shown, however, that it's unlikely that HGT alone could enable genetic parasites to persist for long periods of time, assuming typical HGT rates. Later research suggested that random fluctuations in the HGT rates might allow for the persistence of some genetic parasites. Now in the new study, the researchers analyzed large amounts of data on the spread of genetic parasites in microbial populations, and used it to estimate the minimum HGT transfer rates required for the long-term survival of genetic parasites. The analysis involved using mathematical modelling and comparative genomics to quantify the effects of various factors on the spread and persistence of genetic parasites. The researchers found that, although the critical HGT rate depends on the strength of natural selection and the rate of gene deletion, the typical HGT rates of genetic parasites are generally high enough to guarantee their long-term survival. The findings provide evidence that genetic parasites may use HGT to overcome natural selection and persist in their hosts' genomes for billions of years. Their results also help explain why different types of genetic parasites use different strategies. "By quantifying the cost of genetic parasites and the minimum HGT rate that parasites require to persist, we gained a fundamental understanding of why selfish genes differ in their parasitic strategies," Iranzo told Phys.org. "For example, genetic parasites that are very deleterious need very high HGT rates, which can only be achieved by evolving autonomous mechanisms for HGT (the case of viruses and conjugative plasmids) or by piggybacking on another parasite that is autonomous for HGT (the case of toxin-antitoxin modules). Mild genetic parasites, such as transposons, have more options, such as evolving mechanisms that allow them to proliferate within their host genomes." Although genetic parasites do not provide any functional benefits to their hosts, the competition between early living organisms and genetic parasites may have played a vital role in some of the major evolutionary events in the history of living organisms. For example, this competition may have been one of the driving forces behind cell compartmentalization as well as the origin of multicellular life forms, and may have also made living organisms more resistant to other parasite invasions. Understanding the persistence of genetic parasites has implications for understanding these events, as well as to help answer other questions. "A natural extension of our work is to study the interactions among different classes of genetic parasites," Iranzo said. "How does the presence of a genetic parasite affect the long- (and short-) term survival of other genetic parasites? What ecological and evolutionary factors promote cooperation and/or competition among genetic parasites? A second focus would be capturing the transient dynamics observed at the scale of multiple populations and species, where genetic parasites seem to be proliferating in some species and declining in others." GO TO MOUSE and REMOVE selfish genes one by one and see What will Happen Next ! I don't know be, those multi-dimensional entities just might consider you redundant to needs. However, since you are so eager? For trans-species genetic engineering? You need to step up to the plate, man! Assume your rightful mantle of leadership by volunteering to be first in line of all species to be experimented upon. How about lichen, tardigrades and betterexists? You'd become the prime candidate to leadership of the Mars Colony. Yes, yes, we all insist! Judging by the commentators on this site, preaching the glory of achieving the Towers pf Helium? You would be their pluperfect ruler of Mars. Perhaps genetic parasites provide a large pool of "almost genes" from which several random mutations can eventually produce useful genes that are evolutionary beneficial. If these genes were lost at the first mutation then the rate of beneficial evolution would slow down and the organism more likely to go extinct. This would explain why the junk DNA is so much bigger than the DNA that produces genes. I know that simpletons who believe in concept of evolution may balk at this, but another way of looking at this is to think of the possibility that we didn't have so many or any of these parasitic genetic material in the distant past, and they have increased. This could also explain the longevity of ancient peoples. Parasites only exist if the body provides an hospitable environment. Sometimes parasites trick the body into do this. It helps if the body is a gullible bleeding-heart. 1, ancient people generally had much shorter life expectancies than modern people. This is at least mainly because of modern science and technology helping with our survival rather than for genetic reasons. Nevertheless, even when factoring this in, unsurprisingly given their DNA being so similar, there still is no evidence that ancient people generally had greater innate longevity than modern people. 3, Evolution is a proven scientific fact. Yes maybe the general idea of Evolution from a sky high view is a well established paradigm, however the mechanism of how it happens, is not, well understood. What we have been seeing in a string of interesting papers on this site in the last 12 months, this HGT paper just being one, is genetic proof that there is so much more going on than just survival of the fittest. Evolution is not only controlled by random mutations of the germ line. The is so much more going on it its so interesting and wonderful. That which doesn't kill you, makes you stronger. "genetic parasites do not provide any functional benefits to their hosts"
Most of DNA has to be 'junk' or redundant because it it was all functional then any mutation or deletion would break you. And DNA isn't like computer code is, where each line has individual significance. Each sequence results in the synthesis of some other chemical, which then takes part in the chemical reaction soup inside the cell. If the whole DNA was read, it would result in a whole bunch of junk chemicals that would kill the cell, so there's certain markers present that prevent parts of the genome from being activated at all. Koonin is a giant of the field, he writes many interesting papers. This is one of them. It is a well established observation of the general process. And we know the general mechanisms too, while it is complicated and lots of details still to discover. Like science in general. 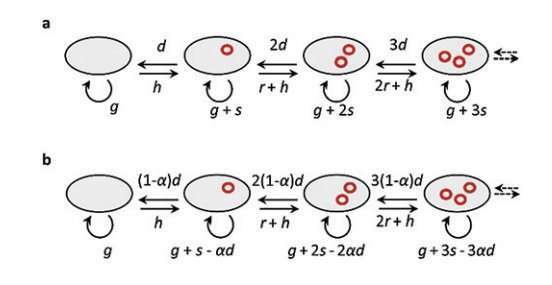 Depends on how you define "junk" and "function", ENCODE showed 80 % function by including evolutionary functionless random transcription at levels that wasn't ensured to have other cell function at that. The original meaning of junk was pseudogenes, which have been found. Calling them names is clearly the best way to convert them to your faith. A big thumbs-up from Jesus!